The Cocktail Class Wooden Boat Racing Association's (CCWBRA) eighth annual National Championships were held on the Chesapeake Bay August 18 at Rock Hall Yacht Club in Rock Hall, MD. 31 competitors came out for this event, with classes for men, women, and youth drivers. The ages of these competitors range from teens to individuals upwards of 80 years old. And that is one of the things that makes this organization so special; competitors young and old coming together through a shared love of wooden boats, classic engines, and good clean racing fun. The Mixed Class is for male and female drivers under 200 pounds. Stay tuned for full race results. 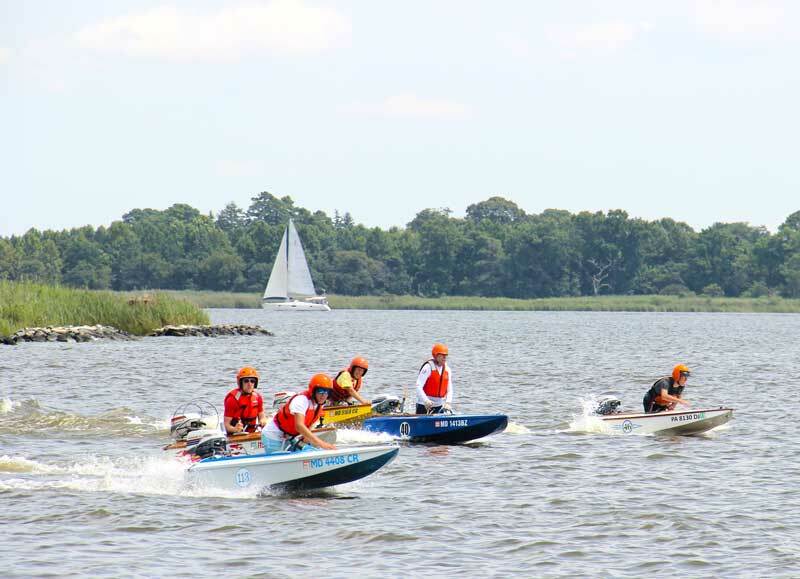 For more racing news and photos from the CCWBRA, as well as OPA, APBA, Smith Island Crab Skiff Association, and others, click to proptalk.com/category/racing. Never heard of the CCWBRA? The CCWBRA was founded in 2010 to encourage and organize racing in the Cocktail Class Runabout. Based on the out-board racer SKUA, an eight foot plywood skimmer designed in 1939 by Charles MacGregor, the Cocktail Class Runabout is an economical, easily constructed, and exciting runabout. It is ideal for racing at all skill levels and ages. Although a young powerboat racing organization, the CCWBRA and its one-design Cocktail Class Runabout have received overwhelming enthusiasm and support from around the world. Boats are being built and raced in 33 states and seven countries. Want to build a cocktail class boat? The association offers a Building Manual with drawings, building notes, and a materials list for $25. Kits are available from Chesapeake Light Craft in Annapolis.